Someone must have said, one must eat to live and not live to eat. As grand as the Indian weddings are, the serving of food and beverages are extravagant and out of the world experience. Like weddings, Indians love to be extravagant with their taste buds too. 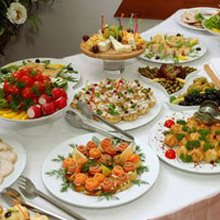 Hence, in weddings you can see an assortment of food items of every type and taste. But often deciding on a particular menu becomes a big deal. Here's a list of some of the Indian wedding menus for you to know and lock on. India is a land of vivid culture and their exemplary dishes. So pertaining to the culture you belong you can keep an elaborate menu that suits every taste bud. Gujarati weddings will have dal batti in their menu for sure because that represents their culture and traditions. Being vegetarians, Gujarati wedding menus can be called as simple and tasty. Contrary to Gujarati food style, Punjabis are known for their extravagant appetite and also food. Punjabi foods are well renowned because of its spicy and extremely alluring taste. The wedding menu undoubtedly is stuffed with every possible Punjabi dishes you can fathom. Every Punjabi wedding is a treat as it satiates everyone who has the appetite for it. Bengalis don't believe in doing things differently because they know their invitees won't enjoy anything other than the regular varieties. Their main course will have a lentil dish exotically prepared, fried brinjals to go with the dal, a mixed veg dish made of rice and other vegetables, a paneer dish for vegetarians, variety of dishes of fish to choose from and some mutton or chicken items.